Keeping creative during those long winter nights. I've had this project in my head for a while. It takes time to get everything in place but sometimes you have just got to make a start and go with it. I love animation, it takes patience but it's worth seeing something come to life. On Speedy Richard and Slow Rider, I was inspired initially by an Aesop's fable and went from there. I've kept all characters and backgrounds analog/organic (no CAD) although I did use a digital camera, iStopmotion and iMovie for the project. Linda suggested I share it here so I hope you enjoy it! 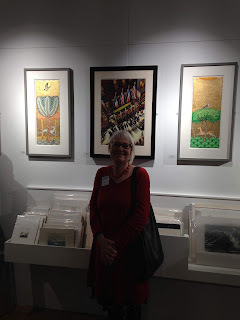 The picture shows Linda at the private view with her two entries chosen for the Royal Water Colour Societies Contemporary Competition. 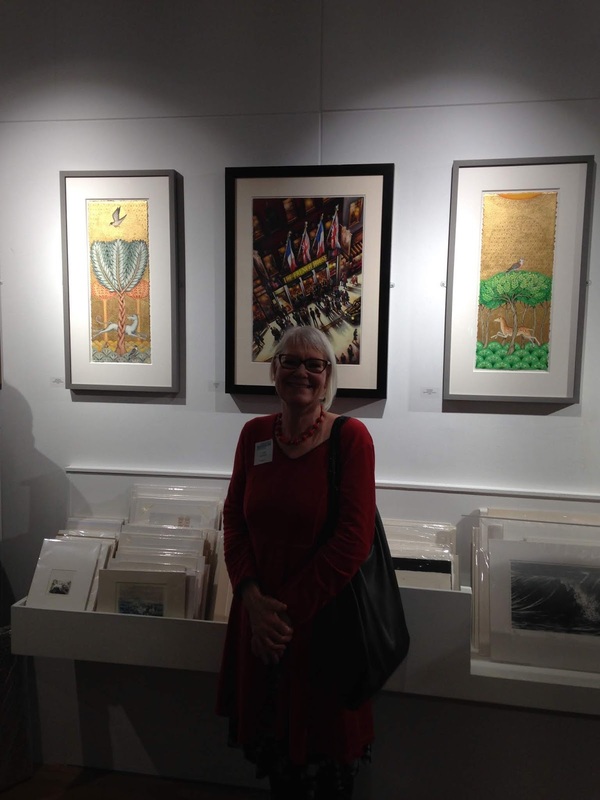 Linda's work has been accepted for the third year running. The art is available to purchase and the gallery is a member of the Own Art scheme where artworks can be purchased interest free over a period of 10 months. We spent a few days soaking up the culture whilst in London. The Pierre Bonnard The Colour Of Memory exhibition is amazing, the colours are astonishing. I came out of the exhibition exhilarated. It's on at Tate Modern. Tate Britain was black and white with Don McCullin photography. The Wallace Collection at Hertford House in Manchester Square had an interesting array of art, armour, ceramics and some very interesting time pieces. Heres a link to the collection. So, back to Shrewsbury, exhausted but inspired. Zest hair salons front window is the most talked about frontage in Shrewsbury; some of the displays it would appear, quite controversial. Never a dull moment as owner Michael Wrate's inspired salon interiors and window dressing are constantly on the move as reflected in the very very stylish do's that emanate from within. Michael has been Linda's hair stylist for a number of years and now the two have collaborated in an exhibition of Linda's art at Zest which runs until the 2nd of June. The video footage was shot during the hanging of Linda's work. Director of TC Homes Victoria Charnley wanted to replicate a street scene for site signage at Alexandra Road in Wellington where TC Homes in conjunction with social housing company Severnside Housing are building 24 houses and apartments. Linda designed a street scene to create a more artistic feel to the signage. The video is behind the scenes footage of the Shropshire Star photo shoot.